More than 200 construction IT professionals descended on the Windy City August 14-15, 2013, to attend AGC of America’s 2013 IT Forum Conference. Continuing to raise the bar each year with its abundance of great content, the conference delivered riveting speakers, ample networking opportunities and many happy end users. James Benham, President, JB Knowledge Technologies Inc., blazed the conference trail with his session on Game-Changing Technology Trends. His look back at what transpired in the IT world the last 12 months and his prediction at what’s to come engaged and inspired attendees. 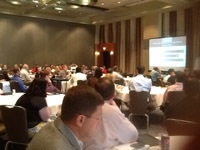 Carolyn Kilborn, purchasing, Henkel Construction Company, commented, "I particularly liked the session by James Benham. His enthusiasm and knowledge makes me think that all the possibilities for the future are here now and that we are at a very exciting time to be in construction." The Keynote on Cyber Security, presented by Damian Walch, Director, Deloitte, canvassed the seriousness and sophistication of cyber threats in today’s world. Walch stressed that as the threat landscape changes, companies must arm themselves with the proper tools to protect against security breaches. Elevating awareness and educating stakeholders are critical. Additional highlights of the conference’s opening day included a session on Disaster Recovery/Business Continuity, presented by five members of the IT Steering Committee: Nige Wingate (IT Director, Mortenson Construction), Steve Mulka (Partner, SIS Software LLC), Raynald Morris (Chief Information Officer, W. M. Jordan Company), Kurt Koenig (Vice President, Penta Technologies), and Howie Piersema (Information Technology, Pepper Construction). Also, the ever-popular Affordable Solutions session, moderated by Del Ameko, IT Manager, Jaynes Corporation, and a networking reception (sponsored by StratusVue) where IT professionals shared challenges, successes and ideas with one another, capped day one. The second and final day of the conference began with a presentation on Cloud-Based Solutions, led by Jeremy Sibert, Director of Technology, Hensel Phelps Construction Co., and Wes Smith, Cloud Executive Officer, The Cram Group. 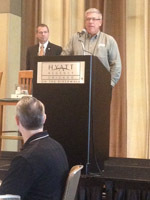 The conversation included their vision for unified, interoperable solutions for the AEC industry. An engaging session on Mobile Devices – Construction in a Post PC World, led by Justin Burleigh, Manager, Vendor Management Office, Bechtel Corporation, and Dan Levin, COO, Box, covered the latest trends of mobility in construction and innovative strategies for mobile technologies. The conference wrapped up with an update by Angus Frost, Senior Consultant, Burger Consulting Group, on the exciting agcXML initiative. Frost introduced the crowd to interoperability and revealed how and why this effort’s wheels are turning and gaining speed. Conference attendee Sam Cotton, information systems, Harmon Group of Companies, appreciated the agcXML update and was excited "to hear that progress" is moving forward. 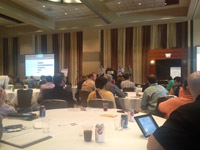 The Town Hall meeting closed up another great IT Forum Conference. When asked to reflect on the value of the conference, Cotton remarked, "By no means would I minimize how I enjoyed the AGC member group, Del’s Affordable Solutions and the Town Hall meeting. It is always reviving to hear how others are dealing with the same issues, as well as hearing how they have resolved common issues at their home sites." First-time attendee Ken Gibson, executive director, Alberta Construction Association, remarked, "I was extremely impressed as a first-time attendee to the AGC IT Forum Conference. As valuable as it was for me, I plan to promote the Conference as important to the bottom line success of the 3,000 member companies of the Alberta Construction Association. I found value of the conference through timely, relevant topics, knowledgeable speakers and panelists, and plenty of opportunities for dialogue and sharing amongst industry practitioners. I would encourage senior managers to attend, as well as IT professionals." Cotton added, "The whole conference was great because of the wide variety of session topics and open discussions. The conference is prepared in a manner to bring knowledgeable innovative speakers for just the right amount of time as well as include you in discussions." Information - how it moves, how it’s protected, and how it can improve productivity - is at the core of the industry. Now is the time for construction IT professionals to sit up, take notice and demand change. As noted in one of the IT Forum Conference sessions, happy users and happy IT: demand both. 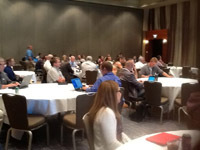 The AGC IT Forum Conference thanks all of its attendees, and especially its sponsors: ASITE, Carrier Cost Management, COINS, Computer Guidance Corporation, Deltek Acumen, iSqFt, Pepper Construction, Sage, and StratusVue. To access presentations, click here: http://www.agc.org/it_forum_handout.